Elaina is using Smore newsletters to spread the word online. Hurricanes form when warm air rises up from ocean water and creates a low air pressure system. The clouds move fast under warm water on the oceans surface. Below, you will see three hurricane predictions, and you will understand how each one affects a hurricanes development. What is Bermuda high?Bermuda High is an area that has high pressure. This occurs during the summer and helps predict weather in eastern parts of the United States. 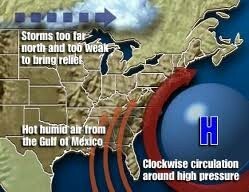 It is a clockwise rotation that brings hot, humid winds to the east and storms to the north. It brings hot weather and ocean water that is cooler than land. How does this affect hurricane development?Well, since it has global winds and large scales high and low pressure systems, it causes hurricanes to move in a different direction. Instead of moving from east to west, it causes hurricanes to move to the north. What is El Nino?El Nino is a change of currents in the Pacific Ocean that occurs every five to eight years and brings unusually war, water to the coast to northern America. In normal El Nino conditions, the wind blows towards the west, across the Pacific Ocean.How does this affect hurricane development?As you know, during El Nino, water is warmer than it should be. It has a great impact on the second part of the hurricane season. 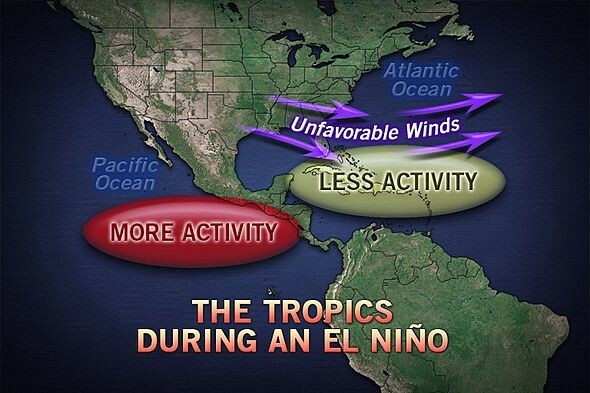 During El Nino, there is less activity in the southeast, and more activity in the southwest part of the United States. What is Water Temperature?Water temperature is how hot or cod water is. Wheh the temperature increases, that indicates that there is alot of energy in the water Water temperature affects the growth and reproduction of living. How does this affect hurricane development? The suns rays warm the ocean water, and when the water is warmed, it evaporates. That creates thunderstorms. When the water eveporates this gives hurricanes a boost in energy. The temperature effects the strength of the Hurricane. Obviosly if a hurricane moves to cold water it will weaked, and if a hurricane is near warm water it will gain strength. Hurricanes can only form in warm water. 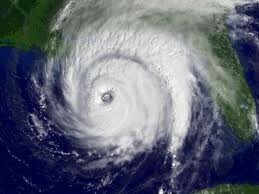 Once Hurricanes reach land, they loose strength because they have no warm water to use as energy. Hurricanes form in warm water. Hurricanes produce strong winds, tornados, ig waves, and heavy rain or flooding.